Smaller or larger widths can be catered for by cutting down to the required size or joining two headers together (a keystone is then used to cover the join). Simply Shutters Window Headers are finished in an authentic stone looking finish to look just as good as the real thing for a fraction of the price! Window headers can be used on their own, with our range of decorative shutters or with pilaster sets to make the Georgian door surround. Available in a number of pre determined widths and 6inch (155mm) or 9inch (230mm) height options, window headers can be used to accentuate any door entrance or window opening to brighten up an otherwise plain façade. 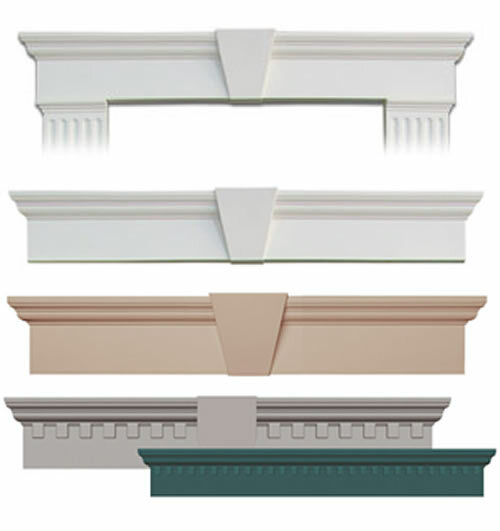 Choose between Flat Panel natural finish or Classic Dentil toothed options. 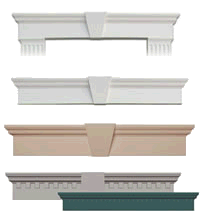 From Top: (1) Plain Header used with Door Pilaster Set (2 & 3) with Keystone (4) Classic Dentil 9" & 6" with and without Keystone. Simply Shutters stocks all sizes and styles of window headers in a soft white colour option. Window headers are also available in Bright White and all the colours from our shutter range on special order. 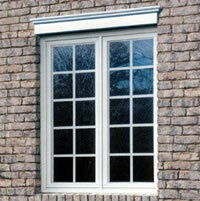 Window headers will fit any size of window or doorway by either shortening or joining units together. 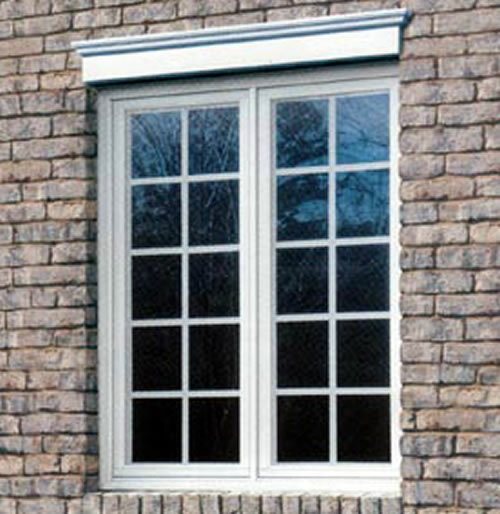 The join is then covered with a centre keystone to provide a professional finish. Window headers comprise of a backing plate that is fixed to the wall (fixings provided) with a cover plate that snaps tight into place over it to hide any visible sign of installation. Quick and easy to install, window headers can be fitted with only a moderate knowledge and skill in D.I.Y. Window headers are available from stock (subject to availability). Should we happen to be out of stock of an item we will notify you immediately. Please allow 2/3 working days for your order to be packaged ready for dispatch.